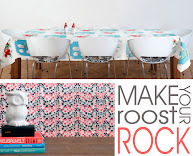 Be sure to click on over to Modern Kiddo and check out their fabulous giveaway...wink, wink. I cant figure out how to enter that one? Do you just post a comment? Also I see people posting several comments does that increase their odds of winning considering they randomly picked with an automated system? 2. Follow us on Twitter. If you are already a follower, tweet about this giveaway—don’t forget to include @modernkiddo in the tweet please! If you comment on Modern Kiddo that will count as one entry in the giveaway, if you follow modernkiddo on twitter and like them on facebook you get 2 more entries, and if you follow us @shop8810 on Twitter you get another entry into the giveaway for a total of 4. You can do a few of them or all of them, it just increases your odds of winning!